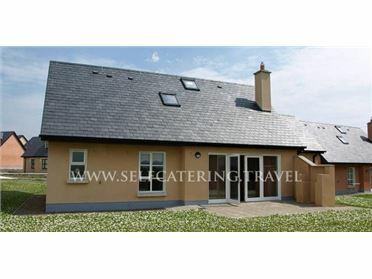 Sea View Cottage is a detached cottage situated in a rural hamlet, two miles from the fishing village of Carrigaholt and eight miles from Kilkee in County Clare. The cottage can sleep up to seven people in four bedrooms consisting of one ground floor double bedroom with an ensuite shower, basin and WC and patio doors, one ground floor twin bedroom, one ground floor single bedroom and one first floor double bedroom with basin and WC. There is also a shower room on the ground floor, with shower, basin and WC. On the ground floor guests have open plan living accommodation featuring a fitted kitchen, a dining area (seats 6) and a sitting area (seats 6) with woodburner and patio doors to the garden. Outside, off road parking is available for 3 cars and there is also a lawned garden and patio with furniture. Sea ViewCottage makes a great base for a relaxing family break in calm surroundings and within easy reach of the coast. Carrigaholt is a small fishing village in County Clare, situated at the mouth of the Moyarta river, which flows into the estuary of the River Shannon. The village has a small selection of pubs and shops and a beach. Visitors can take a trip out on a boat to try and spot dolphins. Within easy reach are the Heritage Town of Kilrush and the coastal town of Kilkee. Electric storage heaters in living area & hallway & woodburner in sitting room. Electric oven & hob, microwave, fridge, washing machine, TV, DVD. Fuel, power & starter pack for woodburner inc. in rent. Bed linen & towels inc. in rent. Off road parking for 3 cars. Lawned garden & patio with furniture. One well-behaved dog welcome. Sorry, no smoking. Shop & pub 2 miles..